Oh, thank goodness. Hank Williams Jr., no-talent hack who rides his father’s coattails, will have his own political radio talk show. | Name-Brand Ketchup. Oh, thank goodness. 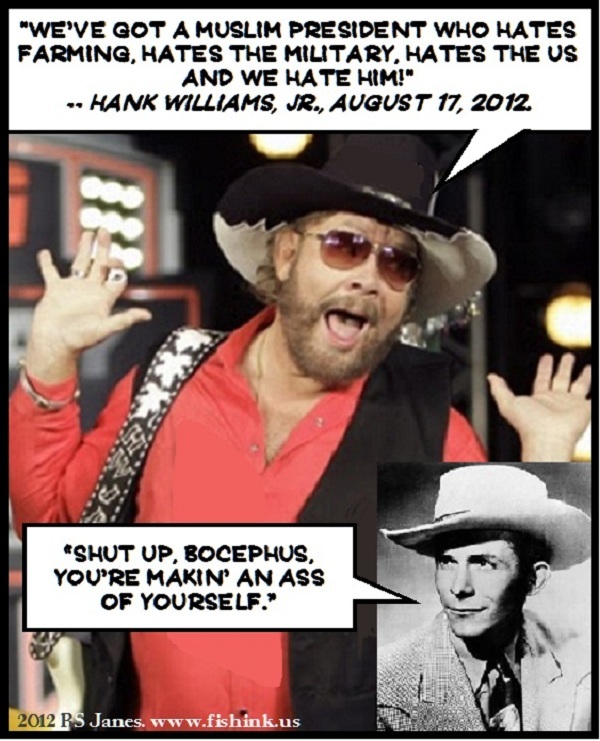 Hank Williams Jr., no-talent hack who rides his father’s coattails, will have his own political radio talk show. Promises to be enlightening. It has “train wreck” written all over it. “Loud and Rowdy” is the fitting title of Hank Williams Jr.‘s new political radio show. The impassioned Republican will host three two-hour broadcasts leading up to the presidential election, airing his notoriously uncensored opinions on the Obama-Romney showdown, as well as giving news updates and, of course, playing a little music. So where can you hear the show? Well, that’s up to your local radio stations, as it’s being offered to any and all of them for free. “Bocephus” is in the process of recording the shows now and plans to have them done by the weekend, his spokesperson tells the Washington Times. In other news: my brother’s dog Bluto will begin a lecture series on quantum physics. Don’t laugh. Bluto knows more about that than Hank Jr. does about politics. Lol. You must be an extremely passionate, bleeding heart liberal to lash out and claim that Hank Jr has no talent just because you disagree with his political views. You’re an idiot. New in town, ain’t cha?